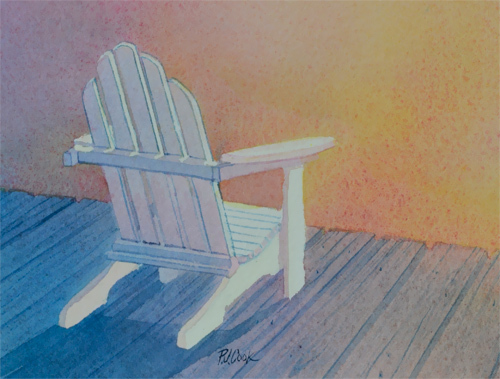 The latest small painting hot off my easel is a watercolor of a Adirondack chair on a wood dock with glowing light. This will fit in a 5 x 7″ mat and frame that is easy to find in craft stores. This painting is done in several layers of 3 colors to achieve the glowing color. Condition: This watercolor is new and fresh off my easel. This painting is currently for sale on eBay in an auction ending tonight! To make a bid on this original watercolor click here. I offer these small paintings at auction for new collectors to become familiar with my work. The painting is offered unframed, if you would like it matted and framed send me an email or comment below for details. I ship to the United States if you are outside the U.S. send me an email using the Contact Page and I can offer you a shipping price. Thanks for your support and good luck bidding on this colorful painting. Be on the lookout for new oil paintings done in one sitting. Also called alla prima – this painting technique is ‘wet on wet’ or direct painting’ and the entire painting is completed in one sitting.